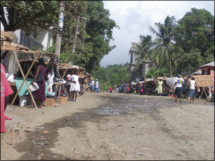 For Hands of Hope, the House of Hope Children's Hospital is our first point of contact when arriving in La Pointe. We consider this our home while ever we are in the north of Haiti. Located in La Pointe, Haiti, the House of Hope was founded in 1950 by a great American lady, Ms. Caroline Bradshaw as a separate ward of the local general hospital. Today, the facility is operated by Linda Félix and Jenny Reitz, Director and co-director respectively who have been running the House of Hope together for over 15 years. Prior to this Linda took care of things single handedly. Of course things were much quieter then. Linda brings understanding and compassion to her position as Director, having been in the care of the House of Hope as a child herself. The number of children in the House of Hope often exceeds 90, even though the wing was designed to hold only a quarter of this number. 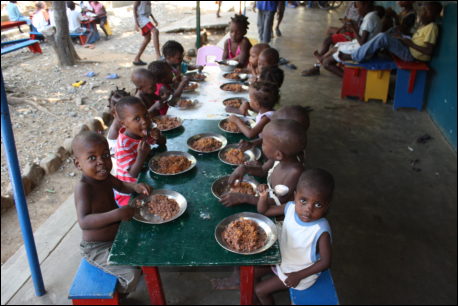 Children admitted to the House of Hope suffer from poverty related diseases such as malnutrition and tuberculosis. A small proportion of the children have physical disabilities. At the hospital, children receive medical treatment for the diseases and other medical conditions. Unfortunately some of the children die due to delays in sending the sick children to the hospital for treatment. Many however are cured and return home but many others are abandoned or become orphaned. This may be because their parents have died of the same diseases. In other cases, parents or relatives will abandon children at the hospital because they are too poor to feed an extra mouth or pay for the treatment and they would rather leave their children where they know that they will be cared for. Linda and Jenny work very closely together. They are women of great faith and over the years have overcome many problems, ranging from political uprisings and attacks from voodooists, to cholera epidemics, floods and hurricanes. In all the problems they encounter, they remain faithful to God and He has been working alongside them and giving them His protection in every situation. The House of Hope has been struggling for many years with several practical issues for which there are no easy solutions. The House of Hope dwells within a busy hospital complex which has gradually expanded over the years to accommodate a growing population in the immediate vicinity. The hospital is very much a centre of the community with busy market and food stalls trading around its perimeter walls. Unfortunately, because of this expansion, the hospital has encroached upon the House of Hope's plot of land to such a degree that the children have very little space to play and with greater numbers of children than ever being admitted into the already crowded hospital, life is becoming very difﬁcult and tensions are at times a little high. Recently, there has been a radical change in the internal running and organisation of the House of Hope Children‘s Hospital and the Notre Espoir (Our Hope) Children's Programme which cares for 40 or so young people and adults. This has been due, in part, to the marriage of Jenny Reitz, the co-director of the Children's hospital and the recognition that there had to be greater responsibility and accountability taken by the young people who are part of Notre Espoir themselves. Despite these radical changes, all is going extremely well. There are, however, serious financial problems due to the high costs of care for the sick children in the hospital, the Notre Espoir family and the upkeep of the building. There are on average around 90 children and young adults in total; plus nurses, cooks, cleaners and other staff members and to provide food and basic care costs in the region of $10,000 a month. As financial support for the House of Hope has declined over the years, they now find themselves increasingly burdened by debt. Hands of Hope are desperate to support this group of people and the amazing work that they do for these, the poorest of children. The Hands of Hope Charity assist the House of Hope by providing an annual grant of $5000. This pales into insignificance set against their ongoing needs. We trust however, that God will provide for them and that He will provide us with the means to help them, no matter how small each gift may seem. Hands of Hope also purchase and provide much needed medicines and medical supplies, without which the hospital would not be able to operate. Emergency funds are also sent to the House of Hope on those occasions when the House of Hope finds itself in desperate financial need. The future plan of the House of Hope, which was to move to a self-sustained location and care for young people with disabilities, is now on hold for the foreseeable future and certainly until the present financial difficulties have been addressed.